Last Wednesday I held my first ever live webinar. It was good fun and everyone enjoyed it so I thought I would share with you exactly how I did it. This is like any other system, the same as everything else, you have to have all your ducks in a row. So first of all, create your Webinar. Now you can talk live, you can do surfing around the Internet, you can show something. Personally, I think you should have something prepared, because things can go wrong. It’s going to be tough on the timing, so you have to kind of have things laid out and organized. You want to make sure it is well thought out and not ad libbed like a Periscope video. This is very different, so keep the spur of the moment, made up, off the cuff, stuff for sites like Periscope or a podcast. On a Webinar, you have to be respectful of your guests, because they are taking time out of their day to watch your training. You are not doing them a favor, they are doing you a favor by coming along to listen. Now I know you think you’re offering great value and you are doing them a favor, but in actual fact, it’s better if you think they are doing you a favor, then you will have more respect, respect their time. So, to prepare, all you need to do is use PowerPoint or Keynote, because people like to make notes, and they like to see things. It doesn’t have to be super flashy, you don’t need fancy backgrounds, you don’t need to know how to do PowerPoint, or anything like this. You can write it out, give it to someone on fiverr and they will put in a PowerPoint for you. You don’t need headers, you don’t need bits on the bottom, you can put it on plain white background, text, stuff that’s big enough for people to read and do not put every single word that you say, otherwise you might as well just send out a report. And put some pictures in, please. Just as a thing for, if you’re doing an hour, you should aim to have maybe 90 or 100 slides. That sounds like a lot, but quite often they are just one-liner text, then the next point on the next slide. Honestly, it sounds overwhelming; but it’s not as bad as you think. I didn’t do any work and I made mine and I don’t do PowerPoints by the way, I managed to do it. So that’s the first thing. But then organizing. Now you can use Go to Webinar, you can use Web-X and there’s others. However, if you are a user of lead pages, and you should be, you can use your lead pages account, you can use so you can set up a webinar sign-up page. So, another thing, pick your time carefully. I recommend that you try between mid day and three o’clock in the afternoon Eastern Time, USA time. That works out for the rest of us because, that would be two o’clock Eastern which is 11 AM Pacific, it is 7 PM UK time, it might not be so good for Australia but I am talking our half of the world. I would also suggest that you then do one other time, so you do it sort of mid 2 o’clock, 1 to 2 o’clock UK time and that will give perhaps Australians a better time, I can’t remember now, it’s probably wrong. But anyway, experiment, don’t just stick to one, try them, see what happens. And offer people a couple, maybe do a couple. So when you are setting up your Webinar sign-up page like I did, put the different times, don’t think people can work it out; put the common times on it. And for those of you that are in America, there’s a whole big world out there, the rest of us, yes we want to listen too, tell us the times, it really does help. If you just put 2 PM EST, a lot of people have no idea what that means. Please, please give us another time and don’t say European time, it’s a big place. From your Webinar sign-up page on Lead pages you can create a thank you page and on the thank you, you can give them the page URL, the website address of the live Webinar. I suggest that you have already set up your Webinar page. So you go to another lead page, there is one of those under Webinars, you will find it (it has a nice big video, and you can pick whichever one you want and that video you just insert your video in there, the code). But you should put up a temporary placeholder video because people when they sign up even if it’s a week in advance will go and check it out. Don’t just leave a blank page, put up a little placeholder and say “Hey, hi, thanks, fantastic, nice to have you here, you are a bit early but bookmark this page, come back at the time and it will all make sense.” So those are three pages, you need. Now in the set up on that page, you can use Chat Roll. Chat Roll has a free trial, 14 days I think, and that’s not very expensive. If you’re going to do these regularly you want to pay; the more people you have on your Webinars the more you have to pay, but it is very very well priced. Go and set it up with Chat Roll. You just embed the code, there’s a place on the lead page, that embeds it, you can even color it to your style if you want, you can do all kinds of things, and you can set a timer. You can put a “Buy” button on that page if you’re going to offer something for sale at the end you can put that, time that to come up after one hour, or two hours. I wouldn’t suggest doing a training for two hours. But then let’s talk about the embed – where you will host your live training. I recommend, and there will be lots of people saying all kinds of problems, but use Google hangouts. It’s very very simple, you can get the embed code, just pop it in, but you don’t want it there now because you’re putting a temporary one, okay. But that’s what you’re going to do. When it comes to running the Webinar, because you’ve got your checklist, you will go in and you will turn on the Chat Roll. Don’t forget to hide the chat roll for now because people will chat, you are not looking at the page, so – hide it for now. Ten minutes before the thing starts, put in your Google hangout code, turn on the Chat Roll and you’re good to go. Now as far as the technical side of your webinar will go — if you’ve got a microphone, such as an Audio Technica ATR2100 – things will sound nice. It is like $40 on Amazon in the states, but difficult to get in other countries. I recommend you buy in the states and have it shipped, it’s not very expensive. It is fantastic, with a USB microphone, plugs into anything, dynamic cardioid I think, which means it’s good. Or you can get a Yeti but Yetis cost more. I’ve got a Yeti and I’ve got the ATR, or you can actually use a Logitech Cleartech headphones with one of those. That is good enough and at around $20, I think, again, on Amazon. Those will do. And that’s your technical stuff. Now, after that you need to think about when you invite people — the e-mails that you use or the messages to invite them. You also need to think about the “Thank you” message, the e-mail auto-responder, you need to think about reminders, sending a reminder on the day. I think you’ll find if you were online you would have gotten three reminders, including one at lunch time, one an hour before and one 10 minutes before. Because a lot of people won’t. They will forget, they won’t turn up, because they might expect a replay. I don’t give replays because want you people to be there. And then lastly, have a friend available somewhere who can text you (mute your phone) or have an iPad on with Skype on it or something. In case something goes wrong at the other end, they can’t hear you, or can’t see you while you are in full flow, otherwise you will never know. In the past, long time ago, I have actually run an entire Webinar for over an hour for someone else, in the States, and I was given the wrong time. Did the whole Webinar for an hour without knowing there was nobody on it. How about that? I had to do it again about three hours later when they told me what happened. Super. Anyway, so that’s the very basics, there is a lot more, which maybe I’ll go into other details and other ones maybe on periscope. Today is a Monday and that means it is time for a book for the week. This one is a great! It’s called “Seven Years to Seven Figures”, seven figures meaning $1,000,000 of income. It’s by Michael Masterson and I think this is his third book. He did “Ready, Fire Aim” which is a fantastic book. This one is very clever. It’s a mixture of other people talking about specialists like investing in property and stocks and things like that, flipping properties. 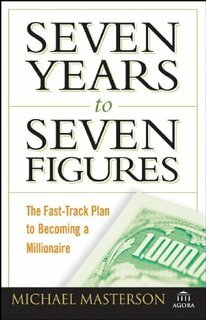 They give you lots of ideas of how you can do it and it would apply to anyone at any level; it just makes you think of what’s possible and what wealthy people do. Michael Masterson is genuinely successful, he’s not just someone who it up, he’s genuinely done that, from nothing, tells you how and how he does it. And there is stuff in there that everyone can do; you do not have to start with a load of money. He didn’t, the system doesn’t. Read it, see what you think. Some of it is from other people talking, some of it is from events, but it’s also got his full story in there. I think Michael Masterson is brilliant, someone you should absolutely follow. His other book is in my top five ever list. Okay, time to go. I’ll see you tomorrow. 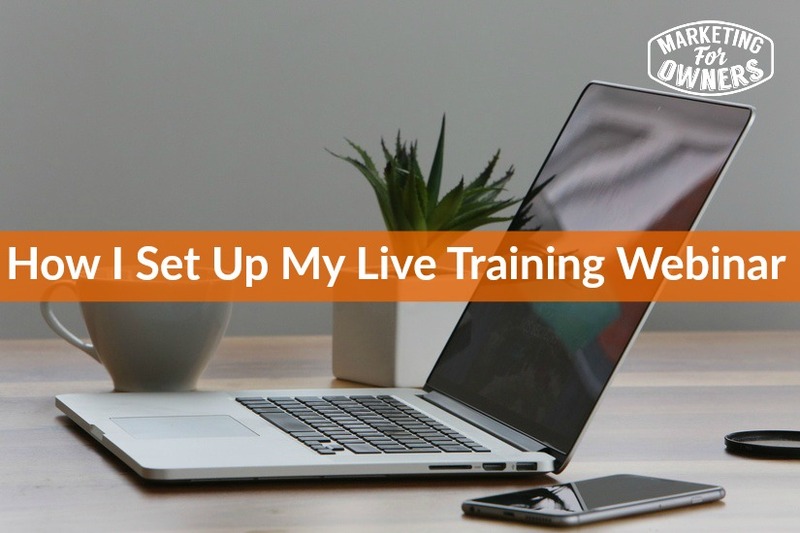 Are you thinking of doing a live training?